Current: What is Component Diagram? 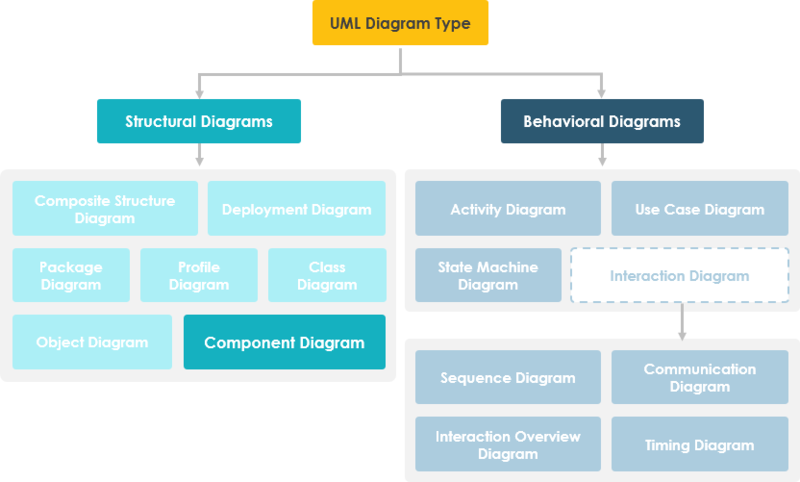 UML Component diagrams are used in modeling the physical aspects of object-oriented systems that are used for visualizing, specifying, and documenting component-based systems and also for constructing executable systems through forward and reverse engineering. 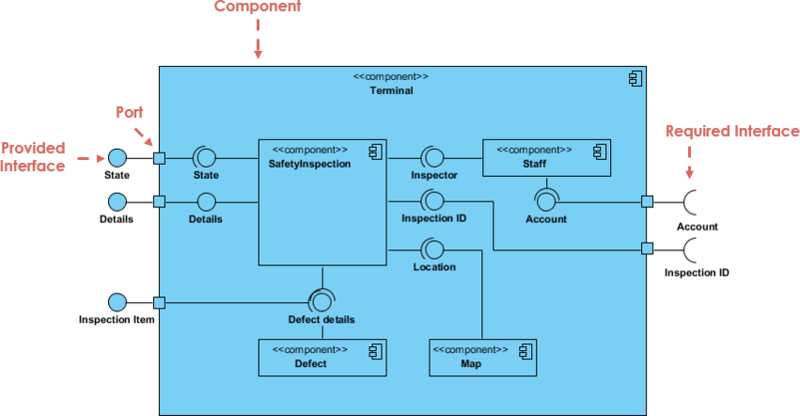 Component diagrams are essentially class diagrams that focus on a system's components that often used to model the static implementation view of a system. A component diagram breaks down the actual system under development into various high levels of functionality. Each component is responsible for one clear aim within the entire system and only interacts with other essential elements on a need-to-know basis. 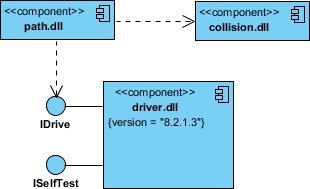 The data (account and inspection ID) flows into the component via the port on the right-hand side and is converted into a format the internal components can use. The interfaces on the right are known as required interfaces, which represents the services the component needed in order to carry out its duty. The data then passes to and through several other components via various connections before it is output at the ports on the left. Those interfaces on the left are known as provided interface, which represents the services to deliver by the exhibiting component. It is important to note that the internal components are surrounded by a large 'box' which can be the overall system itself (in which case there would not be a component symbol in the top right corner) or a subsystem or component of the overall system (in this case the 'box' is a component itself). Provided interface symbols with a complete circle at their end represent an interface that the component provides - this "lollipop" symbol is shorthand for a realization relationship of an interface classifier. Required Interface symbols with only a half circle at their end (a.k.a. sockets) represent an interface that the component requires (in both cases, the interface's name is placed near the interface symbol itself). The subsystem classifier is a specialized version of a component classifier. Because of this, the subsystem notation element inherits all the same rules as the component notation element. The only difference is that a subsystem notation element has the keyword of subsystem instead of component. Graphically, a component diagram is a collection of vertices and arcs and commonly contain components, interfaces and dependency, aggregation, constraint, generalization, association, and realization relationships. It may also contain notes and constraints. An association specifies a semantic relationship that can occur between typed instances. It has at least two ends represented by properties, each of which is connected to the type of the end. More than one end of the association may have the same type. Composite aggregation is a strong form of aggregation that requires a part instance be included in at most one composite at a time. If a composite is deleted, all of its parts are normally deleted with it. A dependency is a relationship that signifies that a single or a set of model elements requires other model elements for their specification or implementation. This means that the complete semantics of the depending elements is either semantically or structurally dependent on the definition of the supplier element(s). Either by forward or reverse engineering, identify the set of source code files of interest and model them as components stereotyped as files. For larger systems, use packages to show groups of source code files. Consider exposing a tagged value indicating such information as the version number of the source code file, its author, and the date it was last changed. Use tools to manage the value of this tag. Model the compilation dependencies among these files using dependencies. Again, use tools to help generate and manage these dependencies. Identify the set of components you'd like to model. Typically, this will involve some or all the components that live on one node, or the distribution of these sets of components across all the nodes in the system. Consider the stereotype of each component in this set. For most systems, you'll find a small number of different kinds of components (such as executables, libraries, tables, files, and documents). You can use the UML's extensibility mechanisms to provide visual cues(clues) for these stereotypes. For each component in this set, consider its relationship to its neighbors. Most often, this will involve interfaces that are exported (realized) by certain components and then imported (used) by others. If you want to expose the seams in your system, model these interfaces explicitly. If you want your model at a higher level of abstraction, elide these relationships by showing only dependencies among the components. Identify the classes in your model that represent your logical database schema. Select a strategy for mapping these classes to tables. You will also want to consider the physical distribution of your databases. Your mapping strategy will be affected by the location in which you want your data to live on your deployed system. To visualize, specify, construct, and document your mapping, create a component diagram that contains components stereotyped as tables. Where possible, use tools to help you transform your logical design into a physical design. 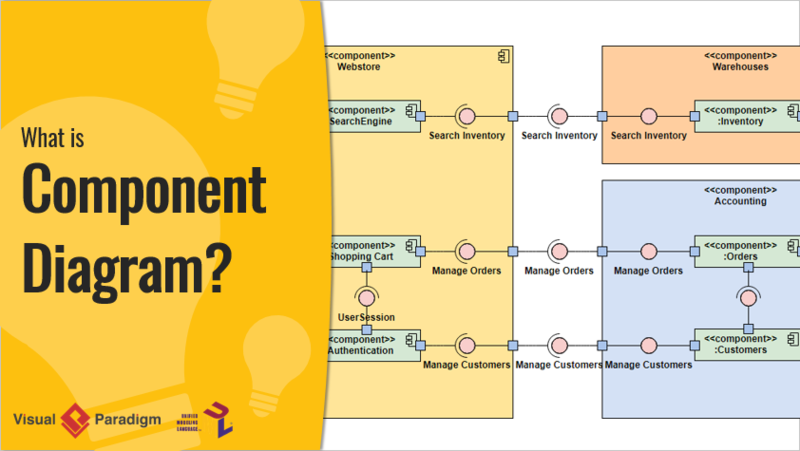 You've learned what a Component Diagram is and how to draw a Component Diagram. It's time to draw a Component Diagram of your own. Get Visual Paradigm Community Edition, a free UML software, and create your own Component Diagram with the free Component Diagram tool. It's easy-to-use and intuitive.